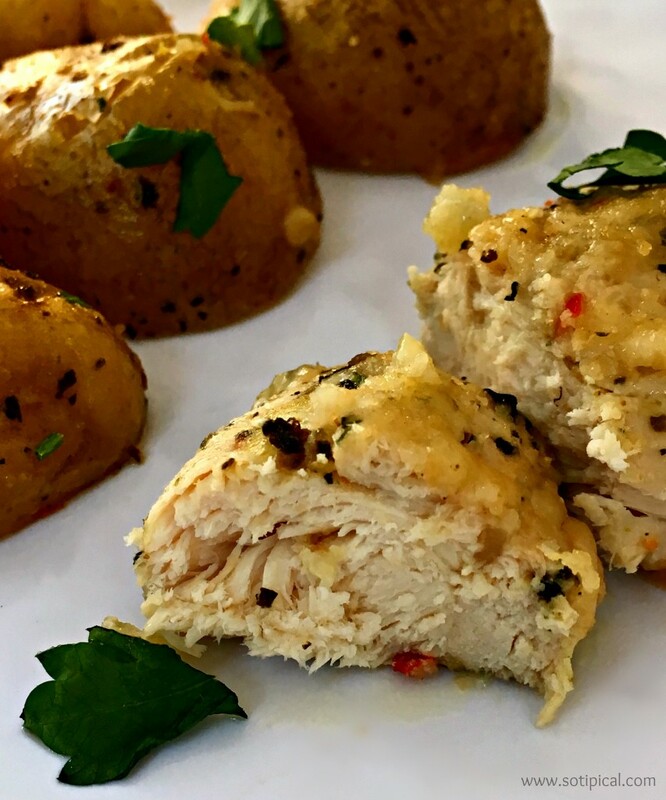 If you want a delicious healthy meal that is so easy to make, then this One Pan Lemon Parmesan Chicken and Potatoes is for you! I love one pan recipes. You basically prep all of your ingredients, then cook them altogether in just one pan! The flavors blend nicely together and best of all, after you’ve enjoyed the meal, there is just one pan to clean! Clean and cut the small potatoes into similar size pieces. Many were pretty small, so I just halved them. The larger ones ended up being cut in quarters. If they are about the same size, they will cook more evenly. In a large baking pan, I added the cleaned and cut potatoes, then tossed them in the 1/4 cup of olive oil and some salt & pepper. (*Optional: Add some fresh grated lemon zest for added flavor) Set aside. Prepare two shallow bowls. One will have 2 eggs, beaten. In the other one, combine the bread crumbs and Italian seasoning. Remove the chicken from the bag and discard the marinade. Dip each piece of chicken in egg, then coat them in the bread crumb mixture. Place the chicken among the potatoes. 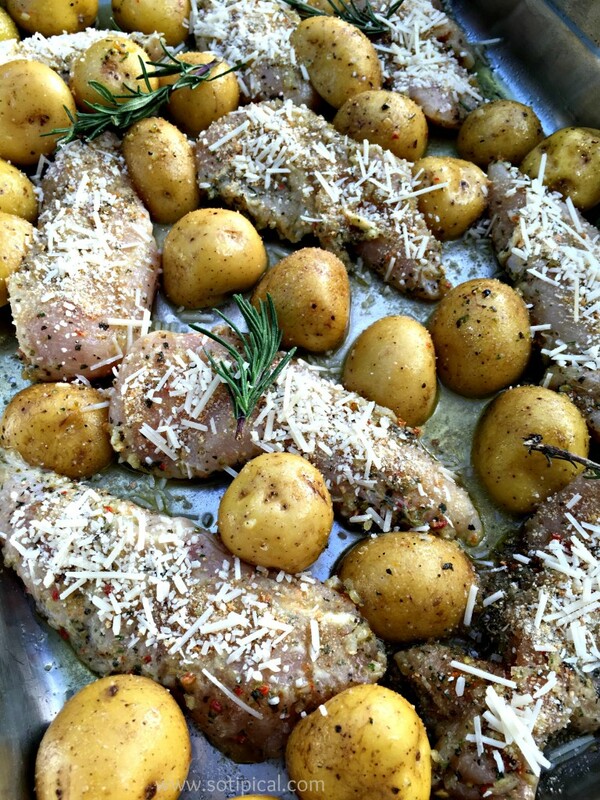 When done, top each piece of chicken with the shredded parmesan. Add a couple of sprigs of fresh rosemary in the pan. Bake for 20-30 minutes. This will depend on the thickness of the chicken. Begin checking at 20 minutes. If not done, then return to oven and check in 5 minute intervals until the juices run clear. Poke the potatoes to check doneness. If they are still too firm, then remove the chicken from the pan and return the potatoes to the oven for another 10-15 minutes. Once the potatoes are tender, return chicken to the pan and sprinkle chopped parsley over the top. Enjoy! Add a simple green salad and you have a well balanced meal! 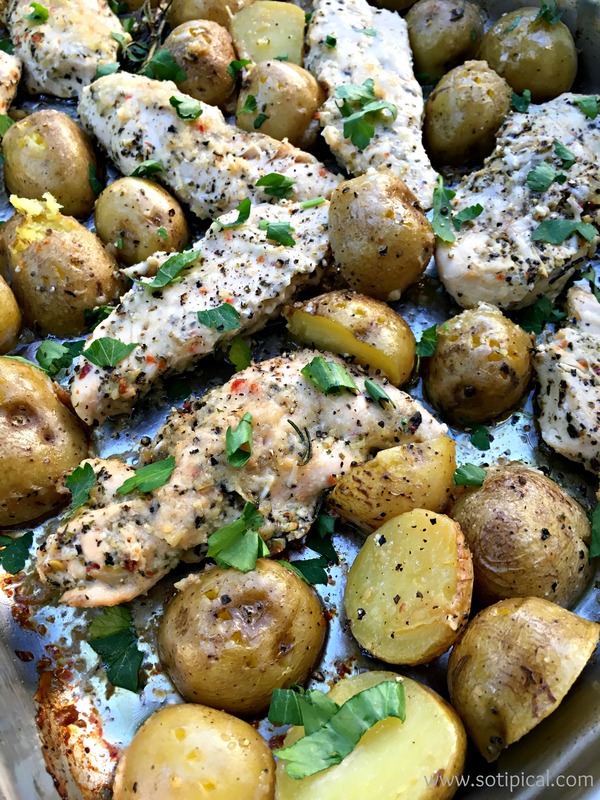 This one pan lemon parmesan chicken and potatoes was a big hit! 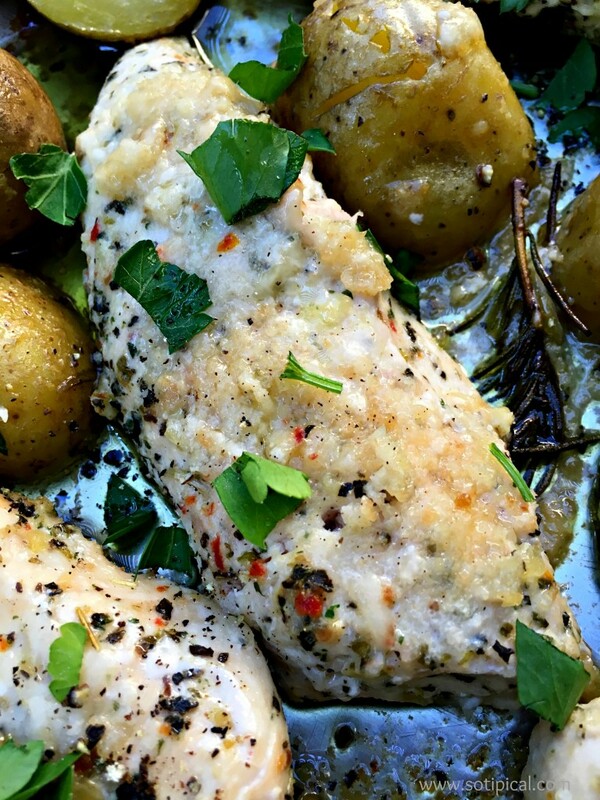 The chicken was moist and delicious, but best of all, so simple to make! What is your favorite one pan meal? Wow, I can’t wait to give this dish a whirl. The combo of flavors and textures plus the fact that’s it’s a “one pan” recipe makes this a winner all the way around. Fantastic! Thanks KC! Hope you enjoy it! This looks delicious and only one pan to clean. That is a winner winner chicken dinner.